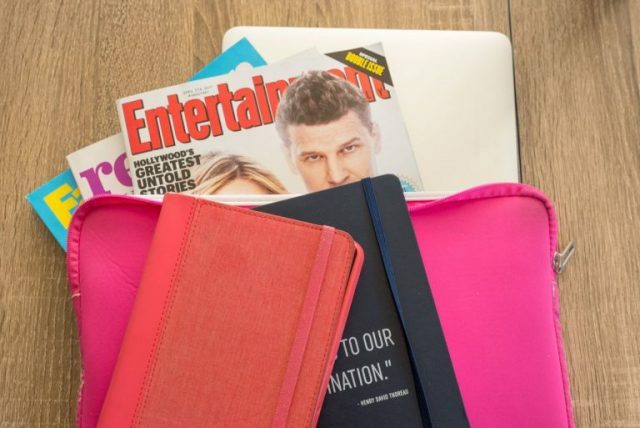 10 Carry On Essentials that make every flight easier! 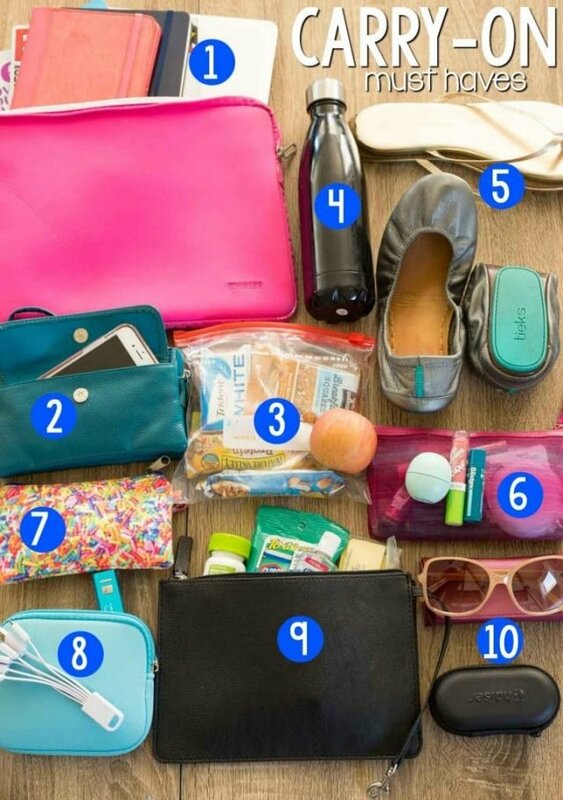 This is what I carry on all my flights and I’ve been so thankful for every item on this list! I always joke that I was a girl scout because I am always prepared. The thought of flying without every single thing I might need gives me a ton of anxiety, so I’ve fine tuned everything I bring with me in my carry-on to make my life on the flight just a little bit easier. I tend to over pack my luggage, but for the carry-on under my seat, I want it thorough but simple and I want everything to be easily accessible. Every single item in that bag has a useful purpose. Anything I don’t need is just extra weight for my shoulder to deal with running though an airport to try and catch my connecting flight. I’d like to preface that this is my carry on essentials list as a single female traveler. This is not what my bag looks like when I travel with my husband or my kid. This is when I’m traveling for business or pleasure – alone. First of all, you need a good carry on bag that will fit everything you need. I’ve gotten so discouraged over the past few years because I cannot find a bag that is absolutely perfect. One that will fit my laptop but have lots of pockets and places to stow things, and it has to have a long cross-body shoulder strap. I never wear it cross body, but what woman wants to tote 20 pounds of stuff around an airport with a huge bag cinched to her shoulder? NO ONE. It took me years and lots of searching to find a good tote bag/shoulder bag that held everything (including my laptop) that had a cross body strap, and was stylish enough to use as a large purse and a business bag for travel. I couldn’t find exactly what I wanted anywhere, but I recently settled for a Calvin Klein bag I found at a discount store. I just took it with me on my trip to Charleston and it was absolutely perfect. If you’re interested, it’s the Calvin Klein Sonoma Reversible Tote. It’s a bit pricey, but it fit everything and was comfortable to wear using just the shoulder straps. Okay so what’s IN the bag? 1. Laptop Case that does double duty. I bring my laptop everywhere I go, even if I’m going on a personal trip. As a small business owner, if I don’t work I don’t get paid, so I always like to have it with me in case of emergencies. Plus, I’m too paranoid to leave it at home in case my house gets robbed. I always put my laptop in a case to protect it from all the other things in my bag and I like having a case that does double duty. I put my boarding passes, a few magazines, maybe even my kindle or a notebook in the case so I can find them easier mid-flight. Check it out: Laptop Neopreen Case – it comes in many colors! When I’m in an airport, I absolutely hate having to search for carry on essentials in my large bag. You’re constantly having to get out money or your ID, and on the plane I want to keep my phone, gum, and Chapstick close. 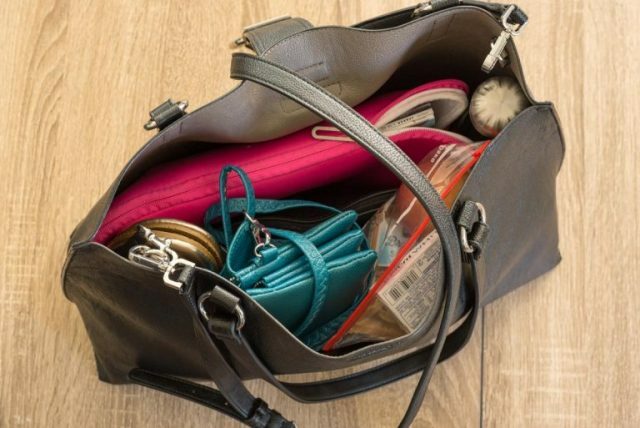 While I’m at my destination, I am often going out for evenings and I always worry about switching wallets to a cute clutch each night because I am certain to lose something important (like a credit card). 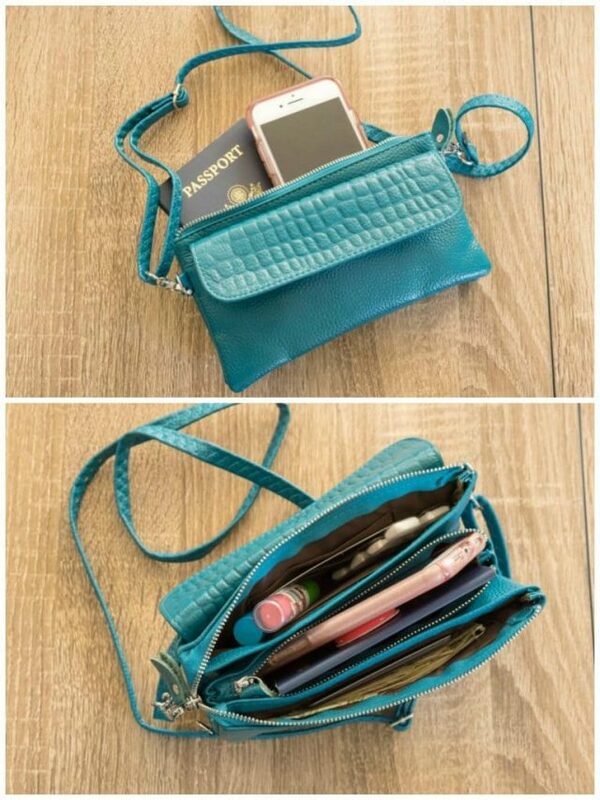 Problem solved with a wallet clutch cross body purse! I wear this on my person through the airport (it doesn’t count as a carry-on because I wear it the whole time). It’s not uncomfortable and my valuables are always near me. Plus the straps detach, so I can use it as a wallet or clutch during my vacation. You can find these at many stores (like Target) or on amazon. 3. and 4. FOOD and water! I always ALWAYS pack snacks on flights. I normally just buy water when I get through security, but if you like carrying your own bottle, you can as long as it’s empty. Many airports now have water filling stations after security. No matter how long or what time my flight is I always pack a bag of snacks and gum. 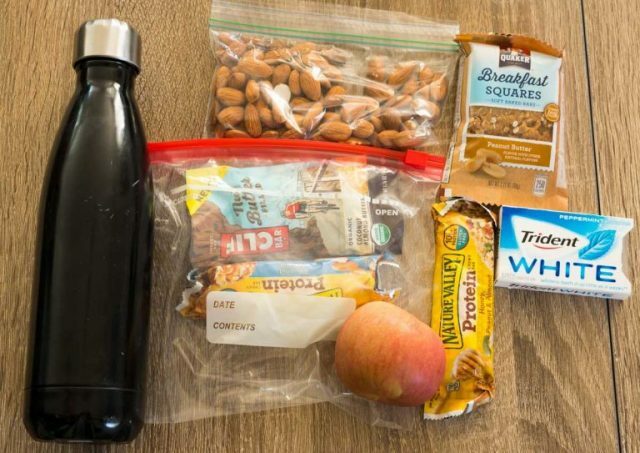 I try to pack protein snacks like granola bars and almonds or little packs of peanut butter, plus an apple or banana. I tend to buy food at airports too, because I need 3 meals a day. Not just snacks, but there have been many times where I’ve run through airports to make my connection and not had time to buy food. This way I’m covered and don’t find myself buying a $15 bag of M&Ms in flight because I’m starving. I wear two kinds of shoes on flights: Either Tieks (flats) or flip flops. They are always the most comfortable things for me to travel in, because I hate shoes. I cannot stand wearing anything restrictive on an airplane, because most of the time I have to remove them at some point. If I wear the flats, I pack the flip flops or vice versa. Tip: pack a gallon size ziploc bag in case you switch shoes. There is nothing grosser than throwing your airport-bottomed shoes in your tote bag without being in something. And DON’T FORGET SOCKS! Sometimes airplanes are cold. Even if you’re going somewhere hot, bring socks for security and the airplane. I have TSA pre-check so I no longer have to remove my shoes, but when I did I would always put on socks. I’d literally rather stab my eyeballs out with a spoon than walk barefoot in the airport. You’ll see that I have several different makeup bags in my carry-on. I do this because the purse I use is very large and cavernous and I want to be able to find everything quick. I have two separate pouches for miscellaneous make-up items (lip gloss, lip liner, bobby pins, hair ties, etc) and for female products. There is nothing worse than being on a flight and realizing you need female product and not having one. These are definitely carry on essentials. Make sure to carry some with you! Please please please DO NOT forget to bring your chargers on the plane. Don’t put them in your checked luggage. Don’t put them in the suitcase that’s in the overhead compartment. Carry, at minimum, a USB cord for your phone and/or any other devices. Newer and bigger airplanes have chargers and USB ports at your seat and most airports have some sort of way to charge your devices near the gates. Unless you plan to do work with pen and paper and read a novel, you want your device fully charged and a way to charge it as you drain the battery. I always carry mini chargers and cords with me in my purse (even at home) as well as when I travel. I also have a spare phone cord and USB plug that stays in my travel bag so I never forget it. These are pictured with #10, but I’m mentioning them here: don’t forget your headphones. Remember that, if you have an iPhone 7, you need the adaptor to use regular headphones. Better yet, get a pair of bluetooth headphones. I finally found a pair that syncs with everything, INCLUDING MY KINDLE. 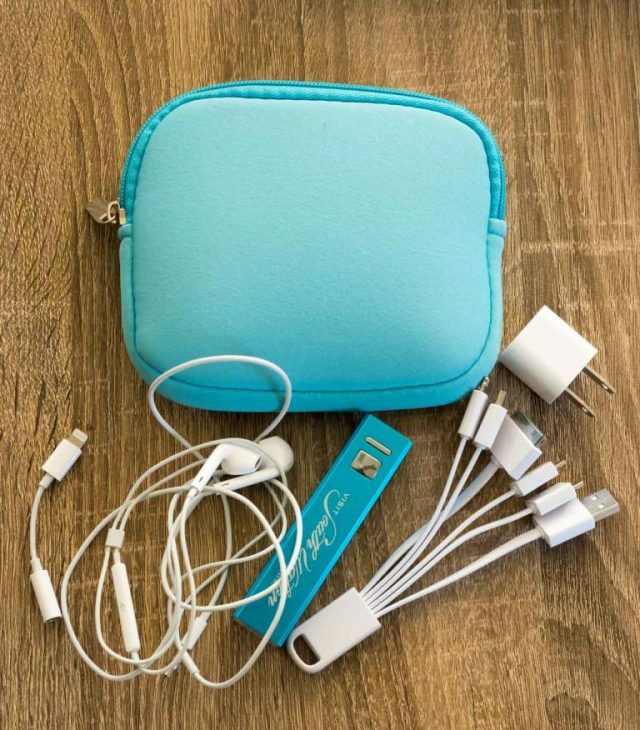 Check them out: Portable Phone/Device Chargers and a Multifunctional Universal Charger (great if you have different devices and phones). Headphones: Phaiser Bluetooth Headphones – they stay in your ears thanks to a little hook, they’re sweat proof, block out noise from the airplane as an added bonus, and did I mention THEY WORK WITH YOUR KINDLE? At under $50 they’re a steal. These are going to vary person to person, but I always put them in the largest bag inside my purse. The purse I bought came with this clipped pouch, so I can always find it. Remember, I carry my wallet and super-essentials (like phone, chapstick, money, and gum) cross body for easy accessibility. This pouch is for the secondary items I want to be able to reach in a flash. 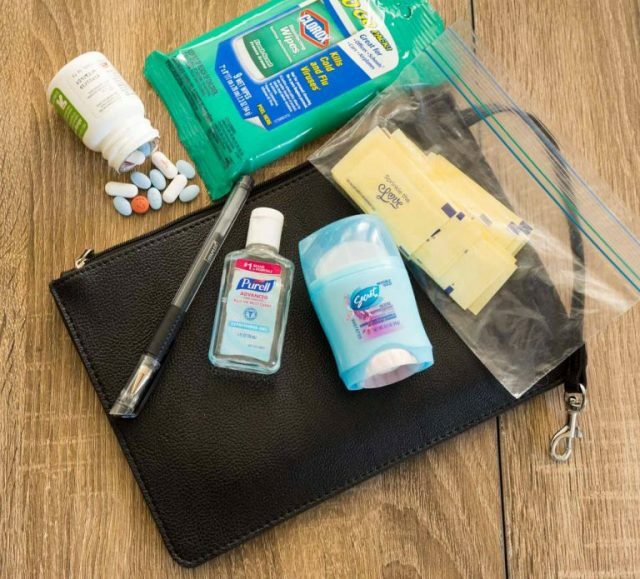 Advil, Purell, a pen, deodorant (because travel days are long! ), keys, etc. I also carry Splenda when I travel because it’s the only sweetener I like and most airlines and some coffee shops don’t have it. Most importantly: Clorox travel wipes. I ALWAYS have these with me because I am that person who wipes down her headrest, seatbelt, armrests, and tray table upon boarding a plane. I clean the remote control, phone, and door handles in the hotel too, so these are always in my bag. Seems intuitive, but please pack them before you leave. Have a second spare pair you wear to the airport or whatever and pack your favorites in your carry on the night before. On THREE of my last trips I forgot my sunglasses and had to buy them there. That’s the hazard when you leave your house at 3am: it’s still dark so you forget them. Pack them up and you’ll never find yourself wearing ugly gas station glasses in all your trip photos. I talked about headphones in #8 but since, other than my purse, they’re my best purchase in months, I’ll put them here again: Phaiser Bluetooth Headphones. That’s it, haha! It’s what’s in my carry on bag whenever I travel, and that doesn’t even count the suitcase, which is a whole other post on how to pack for a trip, but I always carry on a suitcase with a change of clothes in case of disaster. I’m nothing if not pessimistic! Thank you for sharing the tips! I’ll fly for the first time next month, the tips are helpful for me.